Nutshell Cottage is ideally situated on the borders of Gloucestershire, Worcestershire and Herefordshire to provide a central location to visit the picturesque and very different areas of outstanding beauty in this part of the country, including the Forest of Dean, the Wye Valley, the Malverns and the Cotswolds. The map on the right shows how central Nutshell Cottages is to these attractions. Just click on the map to see the full size version. It is close to a number of important national venues including Hartpury College (4 miles), the Three Counties Showground (10 miles) and Prestbury Park Race Course / Cheltenham Spa (15 miles). The Information Guide, which we provide in each room, includes a wealth of information for guests on the region and we are always happy to suggest itineries and routes. Home of the National Hunt Festival, International Music Festival and so much more, Cheltenham offers the visitor beautiful Regency architecture, gardens and parks galore, great restaurants and a fabulous shopping centre. The Cotswolds are an area of outstanding beauty, with rolling hills and escarpments and picturesque Cotswold stone villages and small market towns, including the beautiful Bibury and Bourton on the Water – the Venice of the Cotswolds. 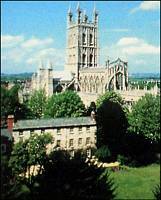 Gloucester, with its historic docks on the River Severn, has played an important part in British history and parliament has even been held at Gloucester Cathedral – now possibly better known for its association with Harry Potter! The Royal Forest of Dean is on of England’s few remaining ancient forests and offers spectacular views and walks in beautiful woodland scenery together with a variety of attractions. The Severn valley and estuary to the south of Gloucester is tidal. 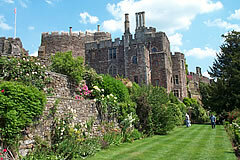 There are a number of pretty villages and towns as well as the famous Berkeley Castle and the internationally famous Slimbridge Wildfowl and Wetlands Centre. The county town of Monmouth is a quiet market town offering a good selection of shops, restaurants, and timeless countryside with lovely walks along the River Wye and Offa's Dyke, as well as a number of historical attractions dating back to Norman times. The lower reaches of the Wye Valley form one of the most beautiful river valleys in the country, with breathtaking countryside and lovely riverside towns and villages. Internationally known for its fine china and its sauce, Worcester has many splendid medieval buildings crowned by the beautiful Cathedral on the banks of the River Severn. 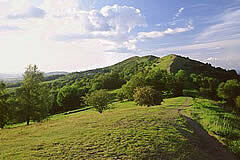 The Malvern Hills provide spectacular scenery, pretty towns and villages and wonderful walks. 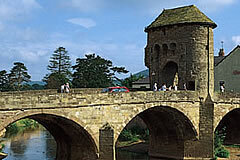 contrasting dramatically with the river meadows of Elgar's beloved River Severn and its riverside towns. This uniquely beautiful area is also host to festivals and events throughout the year, including major shows and events at the Three Counties Showground. 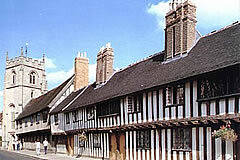 William Shakespeare dominates Stratford upon Avon (35 miles) and has made it Britain's biggest tourist centre after London but it is a rewarding place to visit in its own right with its beautiful half timbered buildings, broad streets and riverside setting. Between the Cotswolds and the Malvern Hills, the tranquil river plains of the Avon are interspersed with small riverside towns, rich in heritage and also famous for their festivals, medieval fayres and regattas. 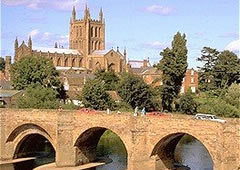 Hereford, dating from the 7th century, stands on the peaceful banks of the beautiful River Wye on the borders of Wales. Hereford Cathedral is one of the oldest in England and houses a number of important artefacts including the Mappa Mundi. Herefordshire, lying between the Malvern Hills and Wales is a picturesque county, famous for its hops and fruit, especially cider apples, and it is home to a number of famous cider makers.